28mm Franco-Prussian war castings from "Eagles of Empire"
More fun painting from the lake for the Analogue Hobbies Painting Challenge! Similar to my first submission, these are "28mm" castings (really closer to 30mm) from Eagles of Empire. There are six French infantrymen and four Prussian infantrymen, all from the Franco-Prussian War, or the War of 1870. These will be used for skirmish gaming for the Franco-Prussian War. The French bugler is mounted on a square base, to help him stand apart as an NCO/leader/character or some sort when the time comes for a game. As before, I absolutely love the French uniforms from this period! Red pantalons FTW! The Prussian uniform in this era is not quite so dramatic as the Imperial French uniforms, although those silly Prussian spiked helmets do stand out a fair bit! One thing about the Prussians is that they wear their longer rain coats tied around their bodies, and that tends to obscure a lot of the detail on the figure, but it does make things a little easier in terms of painting. Spiked helmets for the glory of Prussia! One of the Prussian figures has an eerie finish to it - that's because I thought I would try a paint-on matte finish product. As you can see from the gross, glowing finish, it's not even close to matte, and will be the last f*cking time I try that sh*t product again. I can't spray out the lake, so I thought a paint-on product would work...no luck...I'll try and save that casting when I get back home to Winnipeg after Christmas. There are 10 different 28mm castings in this submission, which added another 50 points toward my 1000 point goal. A pretty good start to this edition of the Analogue Hobbies Painting Challenge! 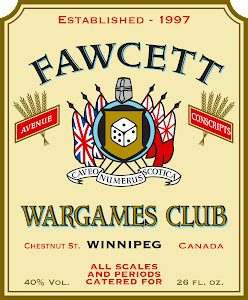 And I'm already looking forward to a Franco-Prussian War skirmish game with the Fawcett Avenue Conscripts some time in the new year! They look great! Out of curiosity, what varnish did you use? I’ve been using Vallejo matte on my Imperial Fists. Got fed up with testors dull coat leaving a satin to semi-gloss finish. Nice work- I've a soft spot for the FPW. Great looking FPW's minis, well done!